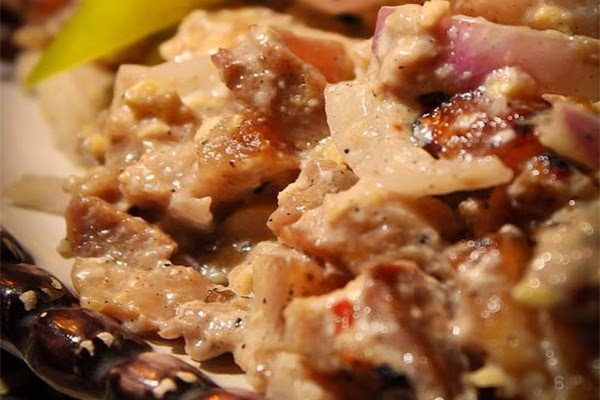 Dinakdakan is a pride of the Ilocano cuisine, most wanted by guys who love the exotic experience of fried or grilled pig parts, face or ear dressed with pig’s brain, vinegar or calamansi juice, chillies and other seasonings. 1. Boil the pork belly or pig ears, liver and pig brain for about 30 minutes or until medium tender. The pig brain should be secured in a zip-lock plastic or regular plastic used in making ice. 2. Grill the pork meat and liver for about 5 minutes, flipping them every once in a while. 3. Slice the pork meat and liver into thin and rectangular shape. 4. Combine the soy sauce, calamansi juice, black pepper, minced onions, chopped chili, mayonnaise, and pig brain to the sliced pork meat and liver. Mix well then garnish it with the onion stalks. 5. Serve with rice or a cold glass of beer. Share and enjoy!